Rosie Hopkins has been running the sweet shop in Lipton for a year now but her business is threatened after an accident in the village. Christmas should be a time of joy but Rosie can't relax and enjoy herself when she is worried about the shop, coupled with the stress of her chaotic family descending upon her from Australia. Rosie should be able to talk to her boyfriend, Stephen but he's having problems of his own and instead of the festive season bringing them together, it seems to be driving them apart. 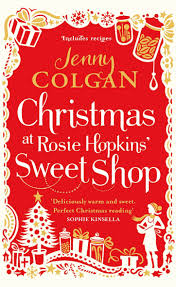 Christmas at Rosie Hopkins' Sweet Shop is a follow up of Jenny Colgan's previous novel, Welcome To Rosie Hopkins' Sweetshop of Dreams. I haven't read the previous book so I was a little concerned I wouldn't be able to keep up with everything that was going on, but it wasn't an issue at all. Everything that needed to be explained was, without going into masses of back story and slowing the pace. I loved the setting of Lipton, a little snowy village where everybody knows everybody else's business, particularly Rosie's shop with its array of treats, both old and new. But while Lipton may be a tiny village, a lot of drama ensues this particular Christmas. There is a lot going on within the book, but none of the stories seem to overshadow the others and I enjoyed every aspect. Rosie is a wonderful character and I loved the teasing nature of her relationship with Stephen, so it was a shame when they stopped communicating properly and their relationship began to suffer. They make such a great couple that I wanted them to realise what was happening and fix it before it was too late.